Some people let the circumstances of life control them. Others find ways to turn obstacles into opportunities and quietly proceed to achieve solid success. Cleveland and Marlene Ellison fit squarely into that second category. 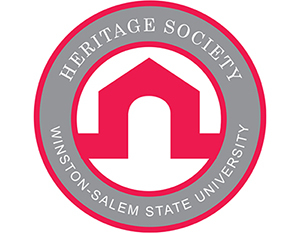 And WSSU is the beneficiary of their upbeat, can-do approach to life. 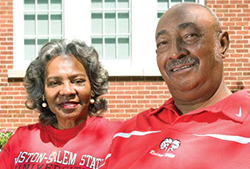 "I came to WSSU as a freshman in 1956," says Cleveland, "and played football my first year. Got cut from the team as a sophomore. Turns out that was one of the best things that could have happened to me. I focused on academics and graduated after 31/2 years with a degree in elementary education." In the classroom he found his calling: helping young people benefit from education. Bit by bit, he added to his own education, earning advanced degrees in education and school administration, advancing from teacher to principal to assistant superintendent to superintendent. Always hard-working, for a period of years he added to his income by operating a newspaper delivery business with 35 paper boys who saw him as a mentor and teacher of money management as much as a boss. At every stage in his career, his high standards and his commitment to his students earned the respect of his peers, even during the precedent-setting era of school integration. "In 1971, I was appointed principal of an elementary school in Eden, and this was my first experience working in an integrated educational setting," he notes. "Instead of expecting negative reaction, I decided to be positive and proactive. I told the parents-white and black alike-to give me until Christmas to work with the students and then if they had any questions or concerns, come to me." The semester-and the year-went by smoothly. Cleveland retired in 1995 to take care of his wife, who died later that year. After her death he focused on an assortment of long-delayed hobbies and interests, ranging from fresh-water fishing to traveling to faithfully following WSSU athletics. He and Marlene married in 2000 and, in her, he found a fellow traveler and fellow believer in the importance of education. "I was only able to go to community college a couple of years," she points out. "I started out as a school secretary and advanced over the years to bookkeeping responsibilities and ultimately was promoted to secretary to the superintendent of Eden City Schools-one of only four blacks in North Carolina to hold that position at the time." Widowed at an early age, she was a personnel specialist in the Rockingham County Schools when she retired in 1997. "We're blessed," she says of the blended family she and Cleveland share, each with two children and a total of six grandchildren. "Neither of us ever made a big salary. We're just hard-working folks who lived within our budget and built up our savings over the years. Our children have been able to go to college-Cleveland's daughter has her M.D. in psychiatry and his son has an MBA and works in New York; my daughters are both WSSU graduates. I'm really pleased that we made the decision to set up this endowment. Through it, we'll be helping students who don't have the resources or family support we had." "WSSU equipped me to go out and make a living and be successful," says Cleveland. "And now they've made it easy to give back, since they have the legal staff and provide professional management and investment of the funds. We set our endowment up so we can contribute to it annually. It means a lot to know we'll be helping young people from our part of the state get an education-and hopefully become educators themselves-even after we're gone."